Do you wonder how K-9 units and CSECO equipment can be used together for narcotics detection? If you travel often and happen to cross the United States border into Canada or Mexico, chances are you’ve seen agents from the US Customs and Border Protection inspecting vehicles with their drug-sniffing K-9 units. The trained contraband detection dogs and their handlers are the first line in narcotics detection. They work effectively to locate the presence of narcotics and illegal substances as well as stolen cash, firearms, alcoholic beverages, explosives, and any other contraband items hidden behind various surfaces. Local, state, and county police agencies in the United States use trained K-9 dogs as part of their law enforcement team. While these dogs serve several purposes (including locating crime evidence, sniffing for possible bombs, arson detection etc. ), most trained canines are used for narcotics detection. These dogs make up a successful detection unit. But what if there’s not a trained drug-sniffing dog not available? What do these law enforcement agencies use in the absence of a trained canine? Fortunately, Campbell/Harris Security Equipment Co. (CSECO) is around to supply the needs of the US Customs and Border Protection (CBP) agents as well as interdiction officers across the country. The company’s founder, Patrick J. Campbell, collaborated closely with CBP agents who asked him to come up with an effective contraband detection tool. The company developed its most renowned product the Buster K-910B Density Meter, with the end users — that is the CBP agents, interdiction officers and law enforcement agencies — in mind. Interdiction officers, customs and borders agents and other police agencies concerned with keeping narcotics and illegal substances off the streets will appreciate the unique and helpful features of the Buster K-910B Density Meter, or simply called the “Buster.” The Buster, with its low intensity radiation emitter and scintillation detector, is used to scan vehicles and buildings for hidden contraband once a K-9 unit has indicated the presence of narcotics. The low intensity gamma radiation makes it safe for use by humans and around trained canines. Another popular CSECO product is the Perfect Vision® V20 Videoscope Inspection System. Consider a trained K-9 that has indicated the presence of narcotics near the fuel tank of a vehicle. The K-9 obviously cannot go into the fuel tank to confirm the narcotics are there. A trained interdiction officer can use the Perfect Vision® V20 Videoscope by placing the 2-way articulating videoscope probe into the fuel tank and confirm the presence of narcotics by viewing the 5 inch LCD VGA display. The Perfect Vision® V20 Videoscope is the only scope certified safe for use in hazardous locations (such as a fuel tank) by Underwriters Laboratory. Sure, a narcotics-sniffing dog would be a great addition to every law enforcement agency. However, handlers train a dog for a certain period to be able to effectively locate the presence of narcotics, illegal drugs, and other contraband. The selection process isn’t only limited to canines but also to handlers themselves, who must be willing and effective in training the dog if it is to be a success. Plus, it is costly to maintain a canine, who must submit to routine and repeated commands during training. However, all the hard work is worth it when the dog is able to deliver and does its job well. CSECO’s products can in no way replace the K-9 units and don’t assume that they should. However, if trained dogs aren’t available, CSECO’s products prove to be an effective and competent alternative for narcotics detection. 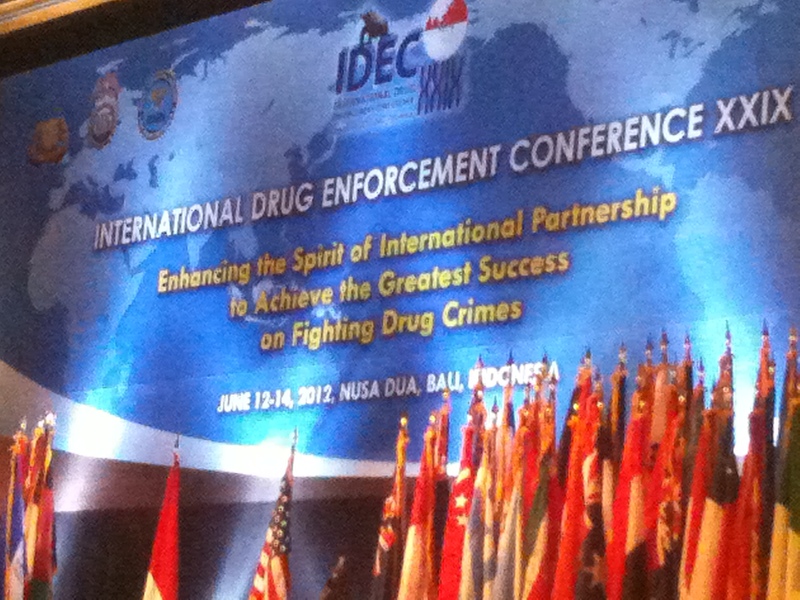 International Sales Director, Damaune Journey is currently attending the IDEC to represent CSECO and demonstrate the effectiveness of our products in various law enforcement agency’s drug interdiction effort. High level drug enforcement officials meet at this annual conference to share drug related information and discuss methods to develop a coordinated approach to stop international drug traffickers. The IDEC has steadily grown since it was established in 1983 and today there are over 100 countries in attendance. Check out some photos of the popular products that are attracting the most attention at this conference here. At the IDEC the majority of the agenda is devoted to forming working group sessions where senior level law enforcement officials meet and discuss strategy and form coordinated efforts to attack large drug trafficking and money laundering organizations. During this time tactics are shared and effective implementation of technology is a prominent topic of conversation. Campbell Harris Security Equipment is in attendance to demonstrate the success stories various law enforcement agencies have had with the aid of the CT-30 Contraband Detection Kit and K910B Density Buster. The Buster, Fiberscope and CT-30 Kit have been promoted by all agencies in attendance for their effectiveness in identifying drugs and other contraband in illegal transport vehicles at international borders. We hope this conference gives us the opportunity to put our interdiction tools to use in all nations involved in an active and aggressive approach to ridding the modern world of illegal drug trafficking.